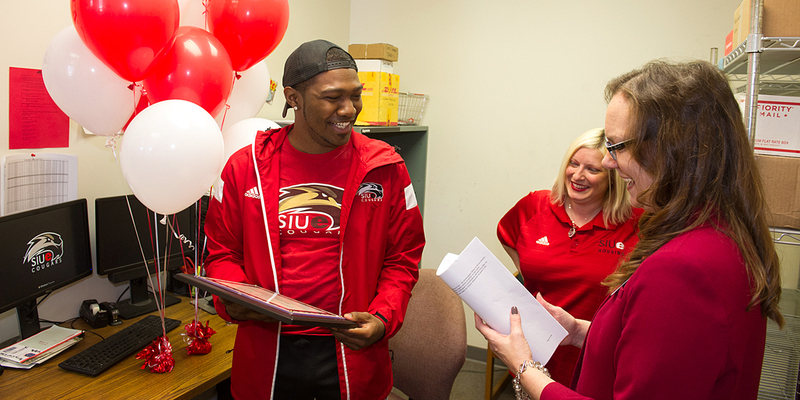 Southern Illinois University Edwardsville requests the pleasure of your company at the annual Service Awards Ceremony to recognize and thank our service award recipients for their valued service to the University. Welcome reception begins at 1:30 p.m. followed by the 2019 Service Awards Recognition Program at 2:00 p.m.
Form 1095-C is a new health insurance form that employers are required to provide to employees who are eligible for health insurance under the rules of the Affordable Care Act (ACA). Form 1095-C displays the months when an employee and their dependents were eligible for, offered, and enrolled in health insurance provided by their employer. This form is not needed to file a tax return and you do not need to send it to the IRS. As previously announced, the Illinois Department of Central Management Services (CMS) will transition to an online, web-based health insurance system on September 30, 2016. The new system will be called MyBenefits Marketplace. This week, CMS, in partnership with the online vendor, Morneau Shepell, will be sending post cards to all members to announce the launch of the new website. The following week, a letter will be mailed to all members. This email serves as a follow-up to the email that was sent below regarding final bills and collection notices. As a reminder, HealthLink is only assisting with final bills and collections notices. They will not assist with documentation that is a bill or reminder of a bill. In addition, our office has made contact with two additional vendors that are willing to assist with final bills/collections notices. We have amended the 403b Plan to allow employees to roll eligible retirement funds into this plan after their retirement date. Employees who participated in both the State Deferred Compensation (457) Plan and the SIUE Supplemental (403b) Retirement Plan, or who have another rollover distribution from an eligible retirement plan, may, within one year of severing employment from SIUE, roll those contributions into the SIUE (403b) Plan with one of the currently approved vendors. Employees are reminded and encouraged to log into MyBenefits Marketplace and review their state benefits. Below is a message we sent a few weeks ago. If you did not receive a letter or no longer have your letter, you can still go to the website and register your account. Once you login, the website will provide you with your CMS-issued Employee I.D. Number (EIN).
! !Access your 2017 1095C Early!! Active employees covered by state insurance; Healthlink, Aetna Plans, HMO Plans, or Reliance Standard, the ACA Gap insurance, may view and print your 2017 1095C form once they are available through Banner Self -Service via CougarNet. To use this feature, you first must provide electronic consent to receive the form this way. Accessing your 1095C through Banner Self Service allows you to view and print your 1095C as often as needed and helps the university keep mailing costs down. We have provided the following information to be used by our employees during the State of Illinois Budget Impasse. Please click on any of the links below. This letter can be given to your healthcare provider if your provider asks for full payment of services - click here to access the letter. On March, 23, 2010 the Patient Protection and Affordable Care Act commonly referred to as ACA was signed into law. was designed to increase the quality and affordability of health care coverage, reduce the number of uninsured citizens by requiring coverage, and reduce healthcare costs for individuals and the government. Recently, you may have received a flyer from the Illinois Department of Central Management Services (CMS) announcing the FY19 Benefits Choice period. The Benefits Choice period is the time for employees to make changes to insurance plans and re-enroll/enroll in flexible spending accounts. It takes place from May 1-31.